Geneticists are usually concerned with picking apart the individual genes that make up a genome, but now two biochemical engineers from the University of Wisconsin Madison have decided to re-assemble all the pieces and give them a good shake. They found that it's not just the genes themselves, but also the way in which they are organised within the genome, that determine the characteristics of an organism. This type of permutation is exactly what keeps us "interesting" despite greater evidence of mechanistic implementation and structure in biology. Even given the fact that "not all permutations are equally likely" the variation in time and space and the Hilbert spaces of DNA, neural nets and life threads are still enormously re-combinatorial. It's not often that maths makes it into the mainstream media, and when it does, it's usually a very specific bit of maths — a statistical result or a certain application — that's being examined. An article published yesterday on the Guardian website makes a nice exception. It explores how maths underlies almost every aspect of modern life, from traffic lights to iTunes. Thank you, Guardian! Why was the computer invented when it was? explains what an algorithm is and why algorithms are so effective. Sometimes a boring story can become a lot more interesting if you do some skilled number juggling. This is what seems to have happened in an article in The Daily Telegraph, which claims that 90% of us carry a gene which increases the risk of high blood pressure by 18%. And high blood pressure is of course linked to dreaded killers like stroke and heart disease. Say that the risk of high blood pressure for someone carrying the more common gene variant is x. Now the 15% decrease associated to the two less common variants takes this down to 0.85x. To get back to x, we need to add 0.15x, and this is exactly 17.647% of 0.85x — hence the claim of an 18% increase in risk. The calculation is undoubtedly correct, but it puts a spin on the story. Rather than taking the common case as a base line and talking about the risk reduction associated to the less common cases, it does things the other way around. This is in stark contrast to the paper's authors own turn of phrase, which links the rarer variants to risk reduction, but says that the common variant "was not significantly associated with either systolic or diastolic blood pressure." It's a bit like noting that some people live to 110 and then complaining that most of us die prematurely. "This is a masterful piece of re-framing of the evidence," says Spiegelhalter on his blog. "Not exactly wrong, but definitely changing the story. Just like a change from 98% to 96% in a survival rate seems a lot more innocuous than a doubling of the mortality rate from 2% to 4%." If you'd like to find out more about risk and uncertainty, visit the Understanding Uncertainty website, or read Spiegelhalter's column in Plus. To find out more about simple number smoke screens, read the Plus article The tiger that isn't. How many arms does a spiral galaxy have? Can you spot a galaxy with a "peanut" bulge? Or how about a galactic merger? You — yes, you — can answer these and other strange questions, along with other ordinary web users who, by working together, have proven to be just as good at galaxy-spotting as professional astronomers. Find out how you can help classify the inhabitants of the Galaxy Zoo! It's not often I get misty-eyed reading a book about mathematics, but that was just what happened when I read this, and several other poems, in the poetry collection Strange Attractors: Poems of love and mathematics. The idea of a love poem is not new, love has inspired poets for millennia. But the combination of maths and love poetry might seem an odd mix. Despite loving maths myself, I was a little skeptical when I picked up this book, and thought it would be a tongue-in-cheek selection of witty but humorous poems about love using mathematical language and imagery. There are some funny poems giving a mathematical take on love, (I particularly liked "Valentine" by Michael Stueben), but what pleasantly surprised me was the large number of poems that seem to be really exploring human emotions. I had no idea there would be so many poems suitable for such a collection, or that it would span so many centuries and include so many diverse contributors. The excerpt from King Solomon's "Song of songs" (which is thought to have been written about 765 BC) and Bhaskaracharya's "Lilavati" (a twelfth century Indian mathematician), the "Square Poem in Honor of Elizabeth I" (written by Henry Lok in 1597), as well as contemporary poets from nearly every continent, give the collection significant cultural depth (helpful appendices give brief biographies of both the contributors, and the mathematicians mentioned). It's a nice thought that mathematics, as well as love, is a ubiquitous experience for all of humanity. The collection features some of the most famous love poems, such as Elizabeth Barrett Browning's measuring of love in her sonnet: "How do I love thee, let me count the ways...". One of the most interesting poems using counting is "Who Counts, Counts" by Stephanie Strickland, where the shifting status of relationships, and the bond of motherhood, was conveyed very simply by counting and recounting the people in a relationship. Some of the poems have a mathematical structure, one is even written in the form of a proof. In some poems mathematical concepts are used as metaphors, such as Robin Chapman's sad use of the non-associativity (f(x+y) not equally f(x) + f(y)) to describe a child's experience of divorce in "Nonlinear Function". The final section, where poets (many mathematicians) write about their love of maths, also has many examples of strong expression, and strangely enough, many of these poems seem almost less mathematical than in the previous sections. It is nice to see the passion for the subject that so many mathematicians share expressed in this unusual and open-hearted way. 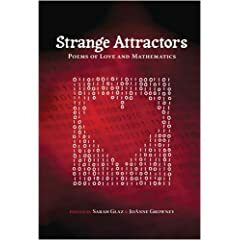 I think one of the strengths of such a book is that not only can it show people who are looking for poems to express love, the beauty of the language of maths, but it also might help explain some of the deep emotions mathematicians feel for their subject. I also like the duality of combining maths and poetry: that as well as taking maths to poetry lovers, it will also expose mathematicians to poetry, and perhaps as the best artistic-scientific collaborations do, allow insight on both sides.